Legal Research Company, LexisNexis announced on Monday that it has acquired Lex Machina, a legal analytics platform. Lex Machina emerged from Stanford in 2010 and is backed by leading venture firms and angel investors, including the former CEO of Thomson Reuters, the former general counsel of Apple and Oracle, and the co-founder of Yahoo! It is the creator of award-winning Legal Analytics®, a next-generation technology platform that transforms how law firms and companies excel in the business and practice of law. It mines litigation data, revealing insights never before available about judges, lawyers, parties, and patents, culled from millions of pages of IP litigation information. A source familiar with the deal was cited by Bloomberg BNA to state that Lex Machina had annual revenue of between $5 million and $8 million and had been seeking to be bought for between $30 million and $35 million. The transaction would allow Lex Machina to retain its management structure and name. CEO Josh Becker was quoted as saying that Lex Machina will gain access to LexisNexis legal content, which includes federal court filings, and will use it to expand Lex Machina’s analytics services outside of its core focus of intellectual property: into commercial, securities, tort, and other areas. 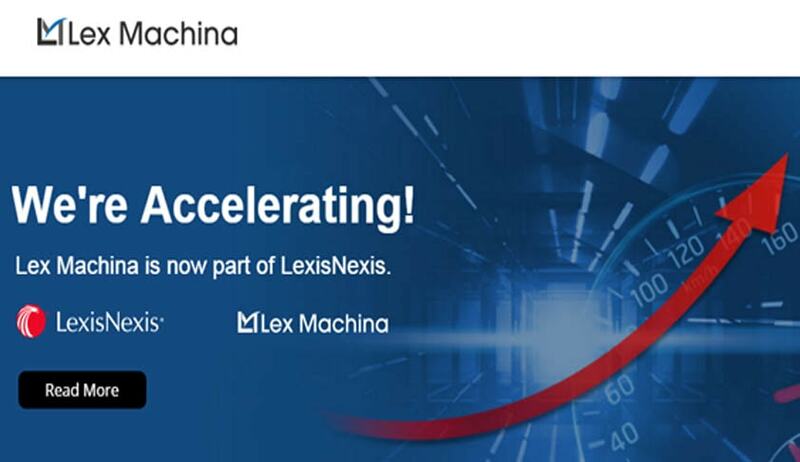 “With its acquisition, Lex Machina becomes part of the ongoing LexisNexis commitment to offer modern, next-generation solutions that help legal professionals work more efficiently, make better-informed decisions and drive success for their clients, practice and business,” Ashley Jefferson, communications coordinator for LexisNexis was quoted as saying. “A look into the near future. The integration of Lex Machina Legal Analytics with the deep collection of LexisNexis content and technology will unleash the creation of new, innovative solutions to help predict the results of legal strategies for all areas of the law.